I just finished binge-watching the fantastic first season of Sense8, the Netflix series written and directed by Andy and Lana Wachowski with Michael Straczyinski. It is extraordinary and totally worth watching. I don’t usually write about TV shows on this blog but having watched the series I almost immediately went searching for intelligent critical commentary to help me parse and rethink what I had just watched. My go-to destination for intelligent (sometimes brilliant) and playful TV analysis is Grantland.com, but there I turned up only one measly review, written after the confused and disappointed writer had watched only the first 3 of the season’s 12 episodes. I looked elsewhere but found almost nothing that matched the excitement and wonder that I felt from watching Sense8. In fact almost nobody (except Abel On, who gets things very right) seems to have reviewed the season in its entirety. And I’m not going to do that here, at least not in detail. But I am going to say this: TV critics are mostly sanctimonious asses who enjoy feeling superior to the Wachowskis because the siblings eschew irony and go straight for the archetypal heart and the engorged libido, which tends to freak journalists out. So I suggest you rely on the 4.6/5 rating from the 2,000+ viewers who rated Sense8 on Rotten Tomatoes, rather than the 5/10 that the series was awarded by the site’s aggregated professional critics. 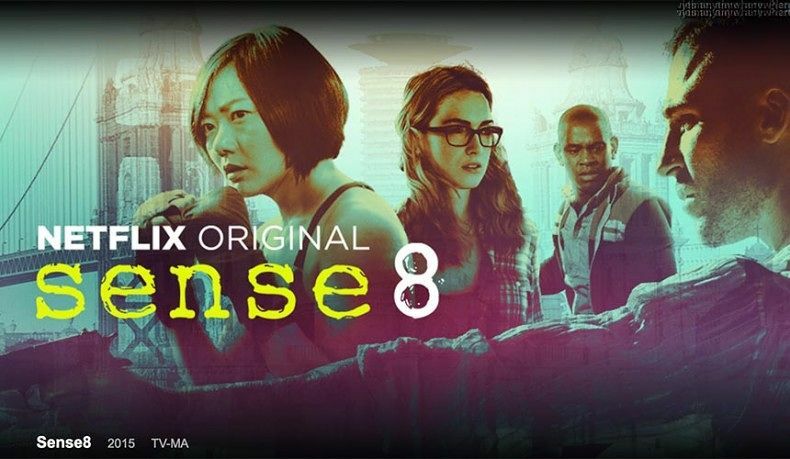 Because Sense8 is a remarkable exploration of the limits and potential of human empathy, expressed in an astonishing number of emotionally charged permutations and manifestations, from polymorphic sexuality to global interculturality to the telempathic fusions between complete strangers that are at the heart of the very cool plot. It looks great, feels better and sounds very cool too. Its a sort of tantric meditation on human frailty and embodied cosmic unity squirted through a stylish and super-charged action filter, and tinged with a constant awareness of the violent impact of abusive patriarchy. Plus it roars with graphic gay love, which is in itself quite a challenge to most viewers to extend their own empathetic abilities beyond TVs traditional comfort zones. One could argue it’s also an allegory about the internet, and I think that is probably true, but only to a point, since it is ultimately a fabulously non-zombiefied take on post-human being. In general, it rocks. And I can’t wait for season 2.